Great stuff from the Packard Auto Museum courtesy of Ted Guthrie. Ted Guthrie has been sending me so many good pics for so long now that he has his own search term over to the right of the blog in the word cloud. His latest e-mail is so good that I’m just going to recreate it here as I recieved it in its entirity. Good to hear from you again Ted and as always, Thanks Very Much for the post! Hi, Steve. 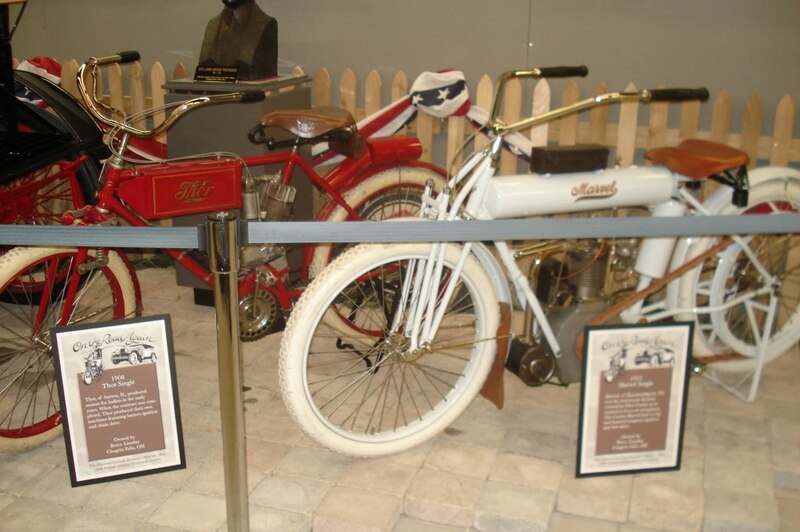 Here are some pics from a nice, little vintage bike display at Warren, Ohio’s Packard Auto Museum. 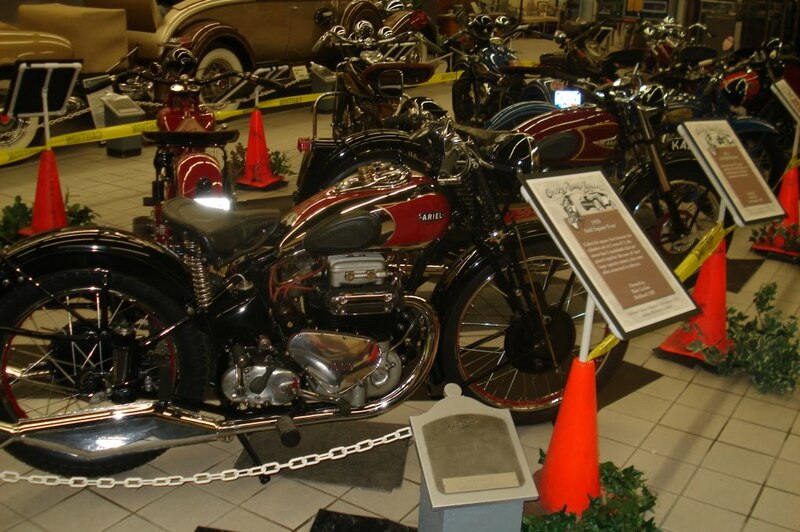 But first, a little background on WHY there is a Packard auto museum in Warren, Ohio. Well, James Ward Packard, founder of the luxury auto giant bearing his name, was born in this small city, which is located in the NE part of the state. Among his other business interests, Mr. Packard opened Packard Electric in 1890. A manufacturer of electrical components for the automobile industry, Delphi Packard Electrical Systems as it is known today, became a part of General Motors in 1932, and is still located in Warren. By contrast, the Packard Motor Car Company, which began production of automobiles in 1900, moved operations to Detroit, Michigan, in 1902. The Packard MCCC became known the world over as a manufacturer of some of the finest, most innovative cars in the world. Among other things, Packard is known for standardizing the use of steering wheels in automobiles (as opposed to tillers), as well as introducing the first V-12 engine in production cars. Packards were among the cars of choice for the rich and famous during the 20’s and 30’s. During the war years, Packard produced Merlin engines for use in P-51 Mustang fighter planes, plus the V-12 engines which were used in PT boats. Unfortunately, following the war, a combination of dated engineering and poor marketing choices, plus a changing customer base, left Packard lagging behind the Big Three auto manufacturers. Falling further and further behind in market share, Packard released its last models in 1958. But, we’re here to talk bikes. 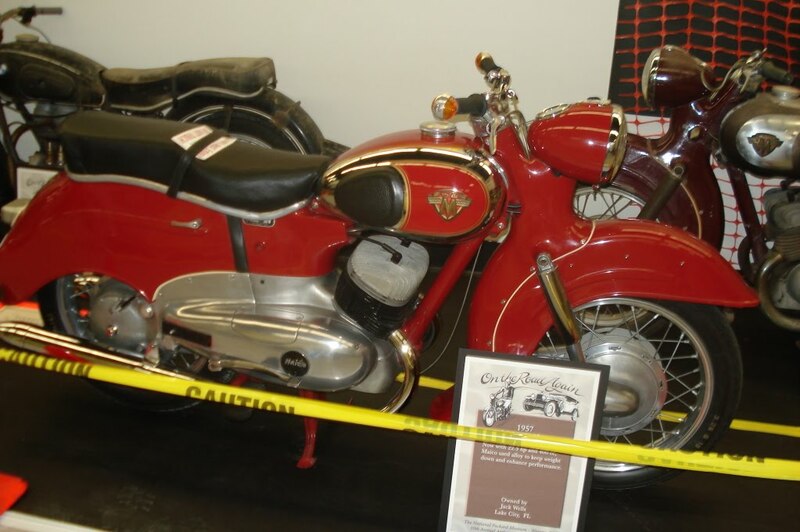 Although automobiles and other products featuring the Packard name, plus a historical record of the company, all have a permanent place in the museum, local collector and motorcycling historian Bruce Williams, organizes a supplemental motorcycle display every winter, which helps to bolster attendance at the museum. Featuring a different theme each year, this season’s display is called “Ready For The Road”. Following are few highlights. 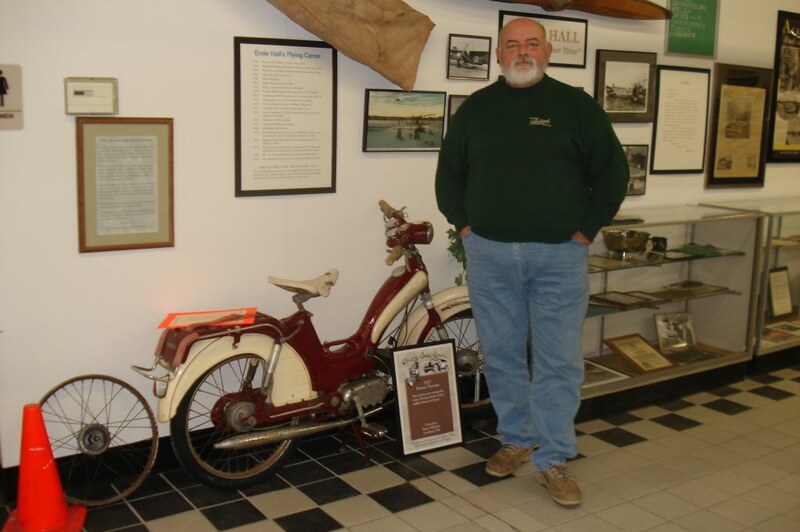 Here’s Bruce, with a German-made Horex moped, which he just unearthed. The little putter features zero miles, having never been fueled. 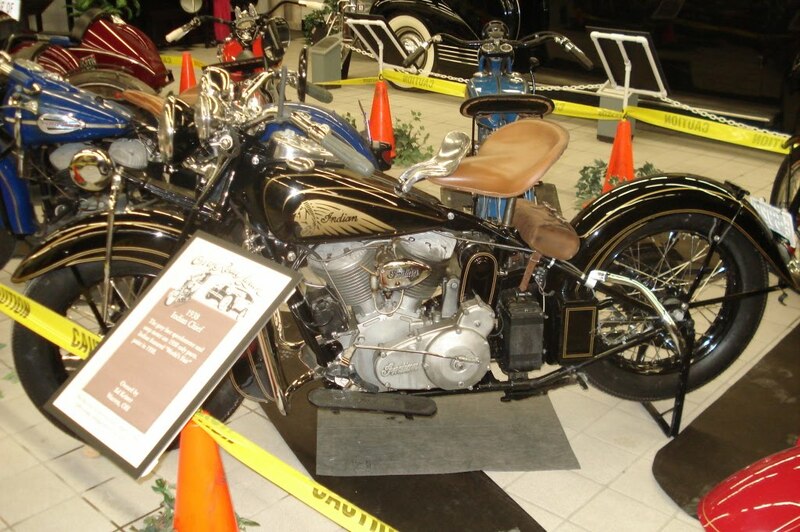 Bruce himself is well-known for his restroration work on Indians and numerous other brands, as well as his extensive collection of BMW’s and other German bikes. 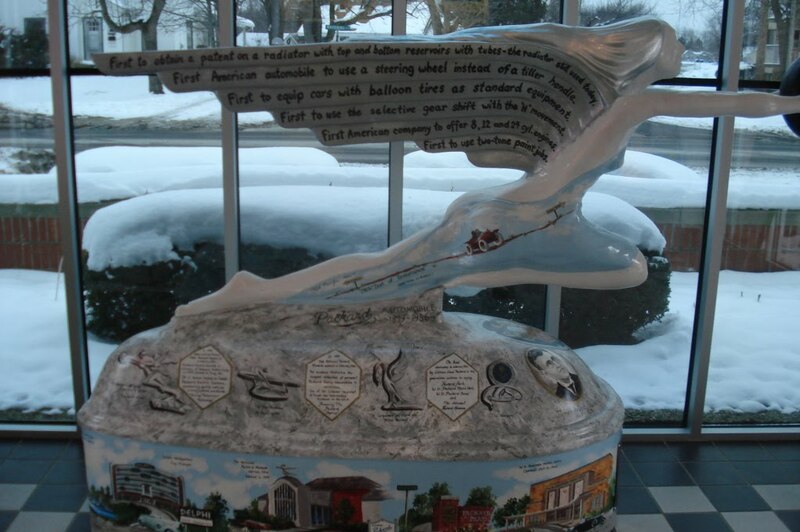 This sculture, which sits in the lobby of the museum, not only shows the design of Packard automobiles’ famous hood ornament, but also lists some of the manufacturer’s innovations in the auto industry. Here’s a couple of real oldies. Just visible to the left is one of the first Packard automobiles ever produced. It runs – regularly. Check out that gorgeous Indian sidecar rig. 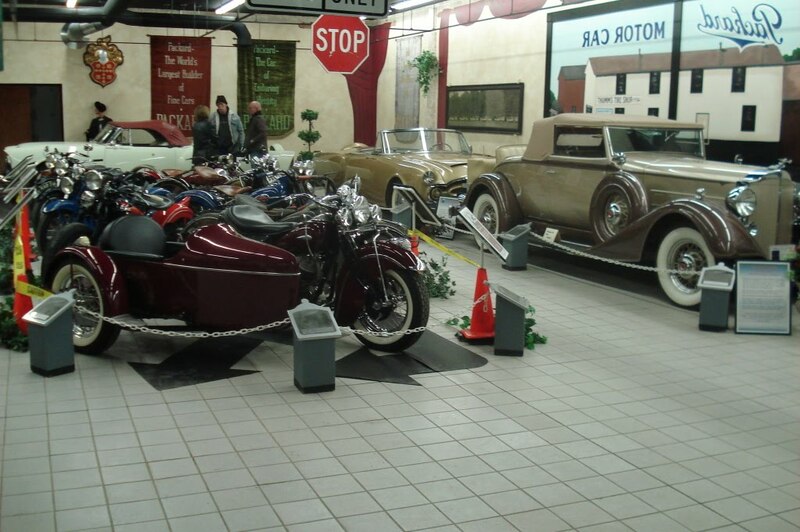 To the right is one of the Packard family’s personal cars, dating to the 30’s, plus two 50’s-era concept cars in the back. Another fabulous Indian. Look closely and you can see that the pinstriping and the tank graphic are all hand-painted. Big Packard limo in the back. Check out these two Ariels. Square Four in the front, and a twin behind it. Fabulous restos. Cool, Maico streetbike from the 50’s. Get a load of all the interesting features. Leading-link forks, all-enclosed bodywork, gorgeous paint & graphics, crankcase induction, big, comfy seat, bar-end turn signals. Also, how ’bout the chicken-coop-find BMW R25 behind and to the left?